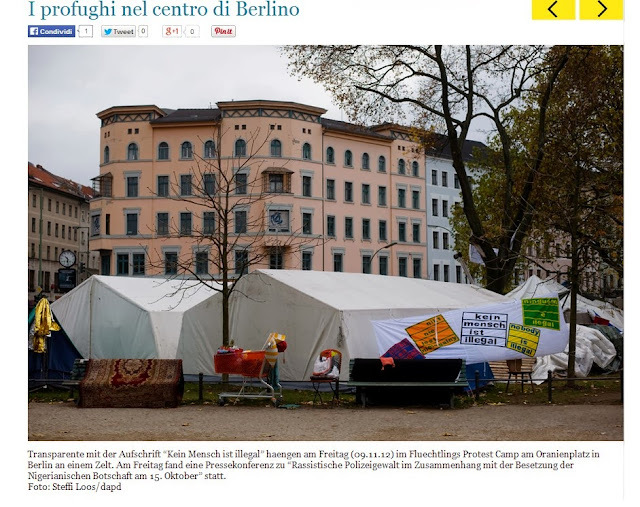 Il problema dei refugees è bollente a Berlino soprattutto, ma coinvolge tutta Europa e non solo. Molti di loro, arrivati a Lampedusa, vengono poi in Germania, ovviamente attratti da una migliore situazione economica e da una maggiore possibilità di ricevere lo stato di ‘asylus’, che riguarda gli aiuti, anche economici e pratici, che i rifugiati politici qui possono avere. Ma, per una legge che dice che in Europa si può chiedere asilo politico solo nel Paese dove prima si accede, la maggioranza di loro, venuti via Lampedusa, non ha nessun diritto in Germania, mentre altri, volati direttamente qui, hanno potuto ottenere, secondo le circostanze, alloggio e stipendio sociale. Inoltre, molti di loro hanno ricevuto dall’Italia, durante il governo Monti, un buono di uscita da 500 e a volte più Euro per venire in Germania, dove però per i motivi sopra elencati, non hanno trovato gli stessi diritti degli altri, cosa che ha complicato la questione, e che ovviamente non è stata accolta con gioia dalla Germania, che si è vista arrivare caterve di persone in fuga dalle guerre africane. Però questo campo, eretto da più di un anno, è stato supportato da molti volontari, dal sindaco del quartiere kreuzberg, da organizzazioni umanitarie. Beh, questa è la situazione. Io non so come si svilupperà questo progetto, sto conoscendo le storie di queste persone, toccanti e interessanti, che protestano da un anno in un campo eretto a Oranienplatz, nel mezzo di Kreuzberg e della città, e li sto invitando a fare un’azione insieme a me, per il loro rispetto e per il loro problema. Ci riuscirò? Today I arrived at Oranien Platz around 2pm. The weather was dusky and humid. I talked with some people, everybody very kind. Most of the people were different from the ones of yesterday, but I recognized some of them, and they did the same to me. So today approaching was a little easier. I talked with a guy from Niger that was living in Lybia before leaving Africa. We talked italian because he had been living in Italy for some time, then he tried in Germany. He has got now a 2 days a week job creating Christmas lights in a shop. He showed me some pictures (from a nice smartphone) very proudly. He told me he had a nice job in Lybia and no money problem, but he can’t go back because of the war and of the terrible political situation there. He was very interested in participating to the performance action. I think he completely understood the point and the sense for them to come. I hope he will. We saved our phone numbers. The school was huge and dirty. I met some people, and also a Rumanian group of families with 10 childrens. They asked me money to take pictures. I gave them 2 euros but I didn’t take any picture. Then Turgay, that’s the name of the Turkich journalist, showed me the space where he lived. I was thinking that was not so different from the prison were he was living 15 years in Turkey.. but he was free, and he got all he needed: books, computer, internet, laundry machine, cooking fire and heating. We decide to make a short interview to him, telling us the important points of the refugee protest. Of course he spoked in German. I will have to contact someone for translation…Then we had an excellent cup of Turkish tea. He was very kind. He is really a nice and smart guy.